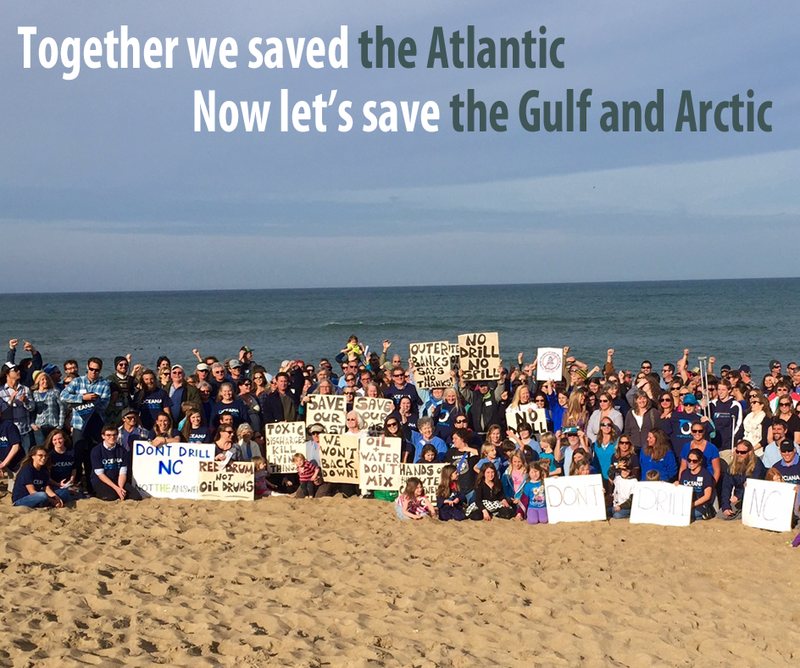 For more than a year we spoke up together for the Atlantic Coast, and President Obama finally listened--foreclosing offshore drilling along the East Coast for at least the next six years. This Sunday, May 15th, we're joining together again with thousands of citizens, environmental allies, and frontline communities for a day of action to urge the president to protect the Arctic and Gulf, as well. 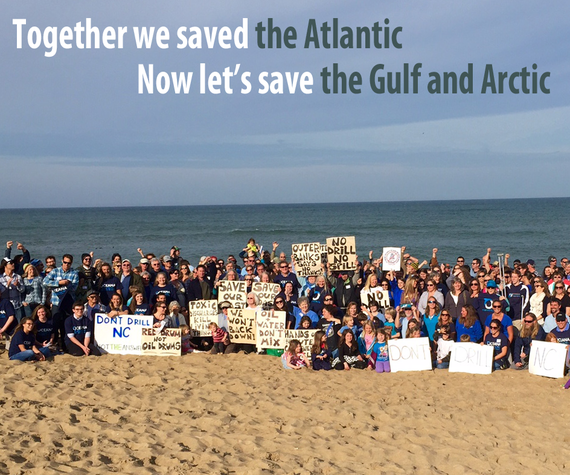 Opening up the coast from Virginia to Georgia to offshore drilling, as the Obama administration proposed 18 months ago, would have spelled disaster for the Atlantic region's environment, economy, and way of life. Visitors have long flocked to the southern Atlantic's beaches for wild ponies; baby sea turtles lurching to the sea; warm water and long, smooth stretches of sand. Indeed, tourism, fishing, and other ocean-related businesses in the four south Atlantic states contributed $14.6 billion to their economies in a single year. Oil exploration and drilling would threaten the right whale and other Atlantic marine life with dangerous seismic air guns, chronic pollution, and frequent blowouts. It would threaten prized beaches with oil-soaked birds and tar balls. And a BP Deepwater Horizon-scale disaster would threaten coastal economies from the southern tip of Florida to northern tip of Maine. That's why Atlantic Coast communities didn't accept the proposal to put their shores in harm's way. More than 100 coastal governments and 1,000 coastal businesses spoke out against it. Up and down the coast, public meetings on the plan drew standing-room only crowds, the vast majority against drilling and dangerous seismic testing. In March the Obama administration yielded at last, removing the Atlantic Ocean entirely from its 2017 to 2022 drilling plan. It was a huge win for the Chesapeake Bay, for the Outer Banks and St. Simons Island - and a testament to the power of citizens and community leaders speaking with one voice. Unfortunately, the administration left new proposed leases for the Arctic and the Gulf in its five-year drilling plan, and left the Atlantic open to seismic testing. So now, we're keeping up the pressure to fully protect the Atlantic, and rallying forces to safeguard our other coasts, too. The Arctic Ocean is one of the most unique marine ecosystems in the world, and its remote location and extreme conditions would make a spill - which the administration concedes is likely -- nearly impossible to clean up. A disaster in the Arctic would threaten whales, walruses and one fifth of the world's polar bear population. More Gulf Coast drilling, meanwhile, would further damage a region still recovering from the BP disaster, where hundreds of thousands of miles of coastal marshes have already been lost to oil and gas development. What's more, to avoid the worst impacts of climate change, from devastating floods to rising seas to wildfires, we must keep the vast majority of the world's fossil fuel reserves in the ground. There's no better place to start than with the fragile Arctic, and with a just transition off fossil fuels that begins with no new drilling in the Gulf. Already, we've delivered over 2 million comments to President Obama, urging him to drop his plans for more ocean drilling. On Sunday, thousands will gather in front of the White House to urge the president to put a permanent end to all new offshore drilling proposals - from Cape Hatteras to the Arctic Ocean. And we'll keep coming together until we've won protections for all of our coastlines for good.